Megan Rapinoe’s hat trick led Seattle Reign FC to a dramatic 5-4 home win over Sky Blue FC on Saturday night in front of a crowd 4,464 at Memorial Stadium. Rapinoe scored the first, second and ninth goals of the match as Seattle escaped with a win after losing a 4-0 lead. Rapinoe’s final goal — the game-winner — came in the 87th minute to help the Reign to the wild 5-4 win. The Reign were up 4-0 in the 56th minute, but conceded four goals over the next 20 minutes before the Rapinoe winner at the end. Rapinoe now leads the NWSL with 12 goals on the season. The Seattle forward kicked off the scoring in the 27th minute with her tenth goal of the season, directly off a free kick. Following a foul on Nahomi Kawasumi by Nikki Stanton about 30 yards from goal, Rapinoe stepped up to take the free kick. Rapinoe bent it with her right foot over the wall and into the upper left corner of the box, beating a leaping Kailen Sheridan to give the Reign a 1-0 lead. The first half ended 1-0, but the goals came fast and furious once the second half began. In the 46th minute, Rapinoe sent a pass to forward Beverly Yanez at the top of the 18. Yanez dribbled into the box and a foul was called as she was tackled in the box by two Sky Blue defenders. Rapinoe took the penalty kick and sent it to the lower left corner of the goal. Sheridan got a hand on it, but the ball hit the near post and spun back across and over the line to put the Reign up 2-0. It was Rapinoe’s 11th goal of the season, moving her one ahead of Kerr — for the moment. Two minutes later, Yanez scored a goal of her own, heading home a cross from Nahomi Kawasumi to give Seattle the 3-0 lead. The assist was Kawasumi’s league-leading seventh of the season. In the 56th minute, the Reign went up 4-0 thanks to a Sky Blue FC own goal as Erica Skroski redirected a cross from Rapinoe into her own net. Rapinoe started the play by dribbling down the left wing and sending a cross into the box. Kawasumi tried to make a play on it, but couldn’t, and the ball found Skroski, who knocked into the net with her knee. But — as we’ve seen so many times this season — Sky Blue FC would not give up. Just two weeks after becoming the second team in league history to win after being down 3-0, Sky Blue was not going down without a fight on Saturday night in Seattle. In the 60th minute, Reign defender Merritt Mathias fouled Leah Galton just inside the box. Sky Blue FC defender Kelley O’Hara converted the penalty kick to put Sky Blue on the board. Just four minutes later, Galton pulled Sky Blue to within two. O’Hara took a shot that was saved by Reign FC goalkeeper Haley Kopmeyer — but the rebound went to Galton, who tapped it in to make it 4-2. Then in the 72nd minute, Daphne Corboz cut the lead to 4-3 after a clearance attempt by Kristen McNabb bounced to Corboz near the penalty spot. Sky Blue FC was within one, just 16 minutes after going down 4-0. In the 76th minute, Sam Kerr — the two-time reigning Player of the Month – tied the game with a header for her 11th goal of the season, which tied her — for the moment — with Rapinoe for the league lead. Kerr, whose hat trick won it for Sky Blue FC two weeks ago, and whose 90th minute header salvaged a draw last week, appeared to be the hero yet again for Sky Blue as the Jersey side had erased a 4-0 deficit. Improbably, it was now 4-4. It’s the first time in NWSL history that a team rallied from being down four goals to tie the match. The Sky Blue FC late-game magic seemed to taking hold yet again. But Megan Rapinoe had other ideas. In the 87th minute, following a quick give-and-go with rookie Katie Johnson that left Rapinoe open at the top of the 18, Rapinoe launched a left-footed screamer into the upper right corner of the net for her league-leading 12th goal of the season. The Reign escaped with the 5-4 win thanks to Rapinoe’s late-game heroics, despite giving up a four-goal lead. The nine combined goals is tied for most in NWSL history (Portland topped Boston 6-3 on July 20, 2014). Sky Blue’s four goals are the most ever in a loss. Sky Blue FC fell to fifth place with a 7-7-2 record and 23 points. The Reign are now in fourth place at 6-3-6 with 24 points. Match ends, Seattle Reign 5, Sky Blue 4. Second Half ends, Seattle Reign 5, Sky Blue 4. Offside, Seattle Reign. Rumi Utsugi tries a through ball, but Katie Johnson is caught offside. Rumi Utsugi (Seattle Reign) wins a free kick on the right wing. Attempt missed. McKenzie Meehan (Sky Blue) header from the centre of the box is close, but misses to the left. Assisted by Kelley O'Hara with a cross following a corner. Attempt missed. Megan Rapinoe (Seattle Reign) left footed shot from a difficult angle on the left is high and wide to the left. Assisted by Katie Johnson with a headed pass. Attempt missed. Samantha Kerr (Sky Blue) right footed shot from a difficult angle on the right is close, but misses to the right. Assisted by McKenzie Meehan. Haley Kopmeyer (Seattle Reign) wins a free kick in the defensive half. Delay in match Rebekah Stott (Seattle Reign) because of an injury. Goal! Seattle Reign 5, Sky Blue 4. Megan Rapinoe (Seattle Reign) left footed shot from the centre of the box to the top right corner. Assisted by Katie Johnson. Attempt saved. McKenzie Meehan (Sky Blue) right footed shot from a difficult angle on the right is saved in the top centre of the goal. Assisted by Samantha Kerr. Foul by Christine Nairn (Seattle Reign). Hand ball by Rebekah Stott (Seattle Reign). Corner, Seattle Reign. Conceded by Leah Galton. Attempt missed. Raquel Rodríguez (Sky Blue) right footed shot from outside the box misses to the left. Assisted by Leah Galton. Substitution, Seattle Reign. Kiersten Dallstream replaces Beverly Yanez. Delay in match Christie Pearce (Sky Blue) because of an injury. Megan Rapinoe (Seattle Reign) is shown the yellow card for a bad foul. Nahomi Kawasumi (Seattle Reign) wins a free kick on the right wing. Offside, Sky Blue. Taylor Lytle tries a through ball, but Leah Galton is caught offside. Goal! Seattle Reign 4, Sky Blue 4. Samantha Kerr (Sky Blue) header from the centre of the box to the top left corner. Assisted by Daphne Corboz with a cross. Goal! Seattle Reign 4, Sky Blue 3. Daphne Corboz (Sky Blue) right footed shot from the centre of the box to the bottom left corner. Substitution, Seattle Reign. Katie Johnson replaces Lindsay Elston. Offside, Seattle Reign. Nahomi Kawasumi tries a through ball, but Beverly Yanez is caught offside. Offside, Seattle Reign. Carson Pickett tries a through ball, but Nahomi Kawasumi is caught offside. Substitution, Seattle Reign. Rebekah Stott replaces Merritt Mathias. Attempt missed. McKenzie Meehan (Sky Blue) header from the centre of the box is close, but misses to the right. Assisted by Leah Galton with a cross. Foul by Lindsay Elston (Seattle Reign). Goal! Seattle Reign 4, Sky Blue 2. Leah Galton (Sky Blue) left footed shot from the left side of the six yard box to the centre of the goal. Attempt saved. Kelley O'Hara (Sky Blue) left footed shot from the centre of the box is saved in the centre of the goal. Assisted by McKenzie Meehan. Attempt missed. Daphne Corboz (Sky Blue) right footed shot from outside the box misses to the right. Assisted by Taylor Lytle. Goal! Seattle Reign 4, Sky Blue 1. Kelley O'Hara (Sky Blue) converts the penalty with a right footed shot to the top left corner. Penalty conceded by Merritt Mathias (Seattle Reign) after a foul in the penalty area. Offside, Seattle Reign. Rumi Utsugi tries a through ball, but Beverly Yanez is caught offside. Attempt missed. Samantha Kerr (Sky Blue) header from the centre of the box misses to the right following a corner. Corner, Sky Blue. Conceded by Carson Pickett. Own Goal by Erica Skroski, Sky Blue. Seattle Reign 4, Sky Blue 0. Attempt saved. Daphne Corboz (Sky Blue) right footed shot from the centre of the box is saved in the centre of the goal. Attempt blocked. Leah Galton (Sky Blue) header from the centre of the box is blocked. Assisted by Kelley O'Hara with a cross. Substitution, Sky Blue. Leah Galton replaces Nikki Stanton. Attempt missed. Raquel Rodríguez (Sky Blue) header from very close range is close, but misses to the right. Assisted by Taylor Lytle with a cross following a corner. Corner, Sky Blue. Conceded by Haley Kopmeyer. Attempt saved. Kelley O'Hara (Sky Blue) right footed shot from the right side of the box is saved in the top centre of the goal. Attempt saved. Samantha Kerr (Sky Blue) header from the centre of the box is saved in the centre of the goal. Assisted by Kelley O'Hara. Attempt saved. Samantha Kerr (Sky Blue) left footed shot from the left side of the box is saved in the centre of the goal. Assisted by Sarah Killion. Goal! Seattle Reign 3, Sky Blue 0. Beverly Yanez (Seattle Reign) header from the centre of the box to the bottom right corner. Assisted by Nahomi Kawasumi with a cross. Goal! Seattle Reign 2, Sky Blue 0. 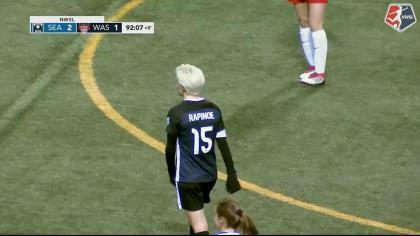 Megan Rapinoe (Seattle Reign) converts the penalty with a right footed shot to the bottom left corner. Penalty conceded by Erica Skroski (Sky Blue) after a foul in the penalty area. Second Half begins Seattle Reign 1, Sky Blue 0. First Half ends, Seattle Reign 1, Sky Blue 0. Offside, Sky Blue. Samantha Kerr tries a through ball, but Kelley O'Hara is caught offside. Offside, Sky Blue. Samantha Kerr tries a through ball, but Daphne Corboz is caught offside. Corner, Sky Blue. Conceded by Kristen McNabb. Attempt missed. Lindsay Elston (Seattle Reign) right footed shot from outside the box is high and wide to the left. Assisted by Rumi Utsugi. Attempt missed. Maya Hayes (Sky Blue) header from the centre of the box is just a bit too high. Assisted by Samantha Kerr with a cross. Attempt blocked. Taylor Lytle (Sky Blue) right footed shot from outside the box is blocked. Attempt missed. Samantha Kerr (Sky Blue) header from the centre of the box misses to the right. Assisted by Raquel Rodríguez. Attempt missed. Samantha Kerr (Sky Blue) header from the centre of the box misses to the left. Assisted by Taylor Lytle with a cross. Merritt Mathias (Seattle Reign) is shown the yellow card for a bad foul. Goal! Seattle Reign 1, Sky Blue 0. Megan Rapinoe (Seattle Reign) from a free kick with a right footed shot to the top left corner. Nahomi Kawasumi (Seattle Reign) wins a free kick in the attacking half. Attempt blocked. Daphne Corboz (Sky Blue) right footed shot from outside the box is blocked. Assisted by Sarah Killion. Attempt missed. 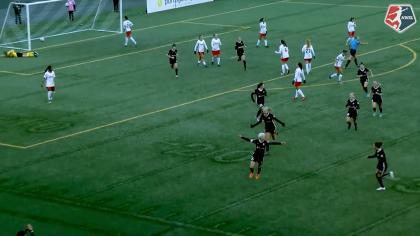 Carson Pickett (Seattle Reign) left footed shot from outside the box misses to the right. Corner, Seattle Reign. Conceded by Kailen Sheridan. Corner, Seattle Reign. Conceded by Sarah Killion. Corner, Seattle Reign. Conceded by Erica Skroski. Attempt blocked. Nahomi Kawasumi (Seattle Reign) right footed shot from the centre of the box is blocked. Assisted by Lindsay Elston with a through ball. Attempt missed. Samantha Kerr (Sky Blue) header from the centre of the box is close, but misses to the left. Assisted by Erica Skroski with a cross following a corner. Attempt saved. Samantha Kerr (Sky Blue) right footed shot from the right side of the box is saved in the bottom right corner. Assisted by Daphne Corboz. Attempt missed. Megan Rapinoe (Seattle Reign) right footed shot from outside the box is high and wide to the right. Attempt blocked. Christine Nairn (Seattle Reign) left footed shot from outside the box is blocked. Attempt missed. Maya Hayes (Sky Blue) right footed shot from the centre of the box is close, but misses the top right corner. Assisted by Samantha Kerr with a headed pass. Attempt blocked. Maya Hayes (Sky Blue) right footed shot from the left side of the box is blocked. Attempt missed. Kelley O'Hara (Sky Blue) right footed shot from the right side of the box is too high. Assisted by Raquel Rodríguez. Corner, Sky Blue. Conceded by Lauren Barnes. Offside, Seattle Reign. Kristen McNabb tries a through ball, but Beverly Yanez is caught offside. Attempt missed. Megan Rapinoe (Seattle Reign) right footed shot from the right side of the box is close, but misses the top right corner. Assisted by Nahomi Kawasumi. Attempt saved. Maya Hayes (Sky Blue) right footed shot from the right side of the six yard box is saved in the centre of the goal. Assisted by Taylor Lytle with a cross.